When we know something or someone very well, it is easy to skip over the nuances that reveal the beauty, wonder and mystery of that object. So it is with the prayer given to us by Jesus in the Sermon on the Mount. We know it by memory, but do we really know what Jesus is actually telling us here? 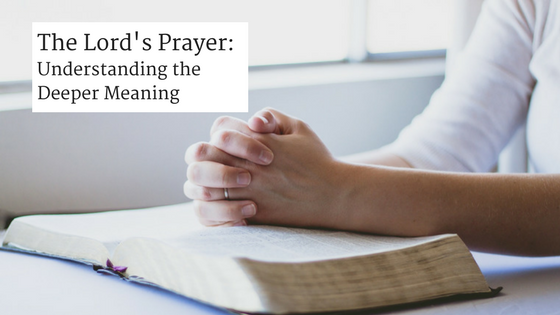 Along with my good friend, Pastor Chuck Davis, we’ve divided the study of the Lord’s Prayer into five devotions as a way of probing beneath the surface of Jesus’ words to the meaning he wants to convey to each one of us. In a very different context, Jesus says to Peter, “Get behind me, Satan! You do not have in mind the things of God, but the things of men” (Mark 8:33). In the Sermon on the Mount, Jesus says much the same thing about our motives behind praying. If we pray to impress people with our religious prowess, we are subverting the very reason to pray. Jesus says that prayer is about connecting with God. It is an ongoing conversation, a dialog where we not only can speak, but we can be spoken to as well. When it comes to prayer, we need to step outside of the discourse and commerce of everyday life so that we can adjust the attitudes of our heart to hear and to be heard, to speak and to be spoken to, not in the normal way of such things, but in the intimate company of God Himself. Prayer is the essential link that connects us to God, who is not detached and foreign, but who desires to give each one of us the good things that he planned for us from the very beginning. After David fell into temptation and sin, he implored God to not take his Holy Spirit away because that would be worse than death (Psalm 51:11). God is not impersonal; he knows everything about us, and he wants us to know him. But if we fake it and babble like the pagans and puff ourselves up like the hypocritical religious leaders, we are engaging in mere pretense that in the end leaves us unhappy, alone, and dissatisfied. God is not far away (James 4:8). He is near, and it is through the power of prayer that we can draw ever closer to him. We should be confident that he hears us and longs for our eternal well-being. The Lord’s Prayer is so familiar that it is easy to miss its depth and complexity. In the first sentence alone, Jesus includes four declarations. First, he addresses God as “Our Father,” not as some stern and unfeeling taskmaster, but as “Daddy,” just as a child would address his own loving and protective father. Then he says, “hallowed be your name,” which sets this Father apart as holy and perfect and above the sinful and imperfect condition of men and women on earth. Then Jesus prays that God’s kingdom will be restored here on earth, replacing the kingdoms that are at war with God and his people. Finally, he prays for the unity that can only exist when the original design takes root here on earth, echoing the harmony that existed at the very beginning when God created the world and all the creatures in it, and he saw that it was very good (Genesis 1:31). In this plentiful and prosperous corner of the world, it is too easy to forget what would happen if all the foods we find in markets and restaurants suddenly vanished. It is difficult to imagine a world where this kind of deprivation could become a reality, but for many, getting access to food is the harsh reality of daily life. When times are good, it is easy to assume provision from the endless supplies afforded by science and enterprise. But is this a reasonable position? Jesus prays to God for daily provision because he knows that God is the only true provider. As he says elsewhere in the Sermon on the Mount, “Therefore, do not worry about tomorrow, for tomorrow will worry about itself. Each day has enough trouble of its own” (Matthew 6:34). To paraphrase another prayer: “Lord, for tomorrow and its needs I do not pray . . .. Please keep me, guide me, love me, Lord, just for today.” Recognizing our daily dependence on God is the only way to live each and every day. Whether we use the word “trespasses,” “debts,” or “sins” when praying the Lord’s Prayer, we are essentially asking God for forgiveness for the countless ways we have fallen away from him. In an earlier encounter, Jesus makes his mission on earth abundantly clear: “It is not the healthy who need a doctor, but the sick. I have not come to call the righteous, but sinners” (Mark 2:17). Paul says “all have sinned and fall short of the glory of God” (Romans 3:23), so when we are praying, “Forgive us,” there are no exceptions or exemptions. Everyone needs to ask for God’s forgiveness because our sin causes us to betray him time and again. When Paul asks, “Who will rescue me from this body of death,” he gives us the answer immediately: “Thanks be to God—through Jesus Christ our Lord!” (Roman 7:24–25) This one line of the Lord’s Prayer is liberating because without forgiveness, we will never escape the destructive consequences growing out of our sin-prone nature. But it is not just about us: We need to forgive as God has forgiven us. Just as God’s forgiveness cost him dearly, to forgive others as God has forgiven us can be costly. But from an eternal point of view, the cost is worth it. Why would God lead us into temptation? Perhaps it is best to think of this dilemma as fundamental to our relationship with God. Jesus seems to be requesting that God not place him in a situation where he would be tempted to betray God. When Jesus was tempted by the devil three times in the wilderness, he resisted by remaining centered in the Holy Spirit. This prayer acknowledges the existence of an evil one, who wanders the earth looking for people not able to withstand the devil’s schemes. Here is the promise for those who believe: “No temptation has seized you except what is common to man. And God is faithful; he will not let you be tempted beyond what you can bear. But when you are tempted, he will also provide a way out so that you can stand up under it” (1 Corinthians 10:13). This entry was posted in From The Blog and tagged Bible, bible study;, Chuck Davis, common prayer, daily bread, daily prayer, deliver us, Eric Kampmann, Faith, forgive, forgive us our debts, forgive us our sins, four gospels, Getting to Know Jesus, God, gospels, Jesus, Lord's Prayer, Matthew, pastor chuck davis, prayer, Sermon on the Mount, stamwich church, the gospel of matthew, the lords prayer, today our daily bread, understanding the Lord's Prayer on April 19, 2017 by Alison.